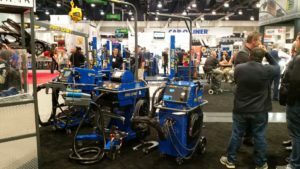 “There’s no one-size-fits-all” option when it comes to buying a welder for use in today’s auto body shops, a luxury repairer noted in an SCRS educational video on MIG/MAG collision repair. Different types of repair work or OEM certifications can require different specifications, brands — or even offerings within a brand, Society of Collision Repair Specialists board member Michael Bradshaw (K&M Collision) observes in Part 2 of SCRS’ MIG/MAG welding trilogy. Bradshaw joined fellow SCRS board member Dave Gruskos (Reliable Automotive Equipment), former board Chairman Andy Dingman (Dingman’s Collision Center), and SCRS Education Committee co-Chairman Toby Chess (Kent Automotive) to talk about welder setup and selection in the film. It was preceded by a look at welder power demands and will be followed later this month by Part 3, which will examine protective gear. How many a shop needs will depend on the number of technicians and the kind of welding work done, Dingman said. His shop’s inventory includes a 220-volt synergic pulse welder for aluminum and a 220-volt welder for welding with silicon bronze. It also has 110s for “normal steel” applications. Shops also shouldn’t expect to be done buying welders once they’ve addressed their current needs. Gruskos noted the metals in vehicles are changing so quickly that a particular certified welder suddenly is insufficient, and it’s time to buy another, he said. “We’ve got several (welders), and are sometimes told we have to buy new ones all the time,” said Bradshaw, whose shop is certified for a mix of luxury and mass-market OEM brands. “There’s no one-size-fits-all in this industry anymore,” he said. Sometimes a repairer will need two or three dedicated aluminum welders because an OEM insists on only a certain brand. “As a shop owner, it’s really a tremendous burden,” he said. Expect to do some research, Bradshaw said. Think about what the shop’s current mix of vehicles is and what it needs to fix going forward, he said. What do OEMs require? What are the electrical demands? Are technicians trained on it? What do you or your techs prefer using? “It’s really a process,” Bradshaw said, estimating that his shop’s last welder purchase probably took “a month or more” of research. Doing one’s own research also can prevent a scenario Bradshaw described: An unscrupulous distributor assures a shop owner a particular welder for sale can handle a certain repair — but it’s not actually among those approved by the OEM. And don’t make the mistake of buying something sold as “like pulse welder,” according to Gruskos. “A pulse welder’s a pulse welder,” he said. Budget more time for training as well, Gruskos suggested. Technicians used to a 110-volt MIG welder shouldn’t expect to instantly pick up a pulse welder and use it correctly, he said. Chess agreed. While welding steel using traditional methods, “it’s basically the same” on a 110 or 220 welder. However, pulse welders for aluminum and MIG brazing are totally different processes, he said. Even with training, it’s possibly for one’s skills to atrophy if the shop doesn’t get in many vehicles requiring that technique. “Now you got to go back and start all over again,” he said.